Freshness becomes a way of life with Freddy! Good, healthy food has a natural texture, colour, and aroma, and is rich in flavour and nutrients. Placing fresh food into a refrigerator or freezer means that after a few days all the qualities of the food are lost. With Freddy you do not simply preserve food, but also keep it fresh! You can prepare complete meals for the whole week and regenerate them when needed, so you always have fresh food on your table. 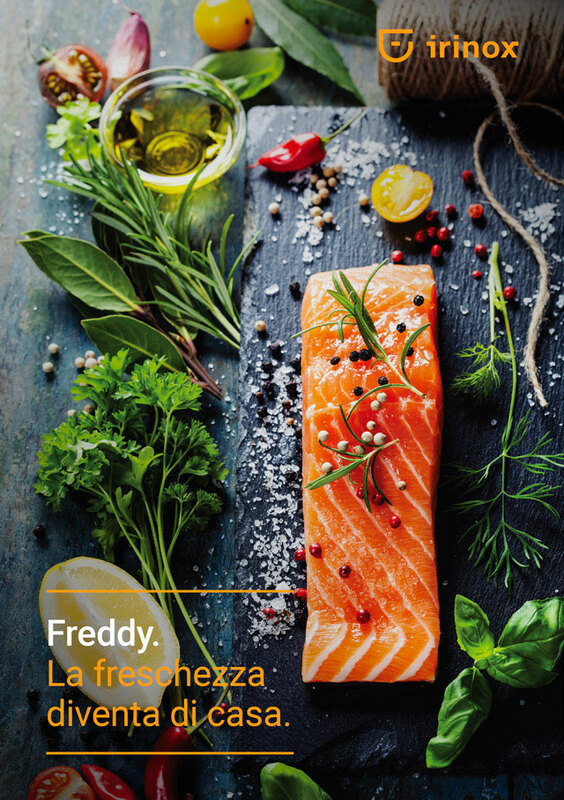 Let us tell you the stories of Gregorio, Marco, Marta and Camilla, and how freshness has become a way of life with Freddy. What a day! A seaside trip, with the sun warming the sand under my bare feet. I took advantage of the chance to take some shots of fishermen engrossed in sorting out their nets. I didn't dare ask, but they gave me some delicious salmon; I love it… Freddy will see to it that it is kept in perfect condition. I love sushi, the emblem of Japanese cuisine. It's becoming more and more popular throughout the world. The essential ingredient for good sushi is raw salmon, which must be absolutely freshly caught. In spite of the freshness of the fish, I know I always have to pay great attention ... there may be parasites in raw fish, such as ANISAKIS. What can I do? The only way to eliminate Anisakis completely is by freezing to a core temperature of -20°C for 24 hours. After shock freezing to a core temperature of -20°C with Freddy (takes approx. 20-25 minutes), I keep the fish in the freezer for a whole day. After at least 24 hours I thaw the fish in the fridge at -3°C with Freddy's controlled thawing cycle and then I can prepare my sushi! What recipe do I love preparing with Freddy? Freeze the salmon for 4 hours with Freddy, then keep it in the freezer for 24 hours. Place the salmon inside Freddy on the controlled thawing cycle at 20°C for 15 minutes. When you take it out of Freddy it is not completely thawed, so it is easier to cut. Season with lemon juice, oil, julienned spring onion, salt and pepper. Mix well. Shape into quenelles and serve. My wife and I love throwing dinner parties at home, not just on weekends! With Freddy, having friends for dinner every Tuesday is not a problem anymore. We can invite our friends over any day of the week even if we have just got home from work, because we know that everything has been prepared in advance and will taste as delicious as we expect! We let Freddy “do the work” for us, including during the dinner. In just a few minutes it regenerates what we have prepared in advance, while we enjoy a glass of good wine with our friends. What recipe do I use to surprise my guests, thanks to Freddy? Blanch the prawns in boiling water with a little salt for 5-6 minutes, drain; cut 90 grams butter into little pieces and let it melt slowly in a casserole. Transfer the butter to a bowl, add 100 grams prawns, a little grated nutmeg, a little paprika and a little ground black pepper. Crush the prawns with a fork and add to the butter. Stir to obtain an even mixture. With the help of a mould or a glass cut the bread slices into round canapés. Melt the remaining butter in a pan, add the canapés and fry until golden brown on both sides. Spread the mixture on the canapés and garnish with remaining prawns. Shock freeze with Freddy at -18°C. The canapés can be kept in the freezer in airtight containers for a couple of weeks. Before serving leave them at room temperature for approx. 15/20 minutes. Ever since I started caring about sound nutrition Freddy has proved to be very useful. With Freddy I can have a healthy, varied diet, because I can cook in advance large quantities of food that I can divide into portions. Food retains its taste and freshness for several weeks, with the added advantage that it's ready on my table in a flash! With Freddy I have been able to prepare a delicious pesto genovese that will keep the deep aroma of freshly picked basil: what satisfaction! Besides, my favourite summer farro or barley salads will remain fresh for a whole week! All I have to do is make the salad, blast chill with Freddy at +3°C and refrigerate in airtight containers. What recipe do I often prepare with Freddy? Place the mixer bowl inside Freddy for 15/20 minutes at -18°C so as to allow it to cool well. Clean 50 basil leaves with a damp tea towel. Put 1 ice cube, ½ dl Liguria extra-virgin olive oil, the basil leaves, a handful of pine nuts, 2 to 5 garlic cloves (according to taste), a little cooking salt, 15 g pecorino romano cheese and 15 g grated Parmesan cheese in the mixer bowl. Mix for 10 seconds, then transfer to a bowl and add ½ dl Liguria extra-virgin olive oil, 15 g pecorino cheese and 15 g grated Parmesan cheese. Pour the pesto into small silicone moulds, shock freeze straight away to -18°C with Freddy, then put the pesto “cubes” in a freezer bag and store in the freezer. Just before using thaw the amount of pesto you need for 20 minutes at 25°C with Freddy. Recipe variation: instead of pine nuts add a handful of sliced, slightly toasted almonds, one hot pepper and the pulp of one green tomato, peeled and seeded. You will obtain an excellent Sicilian pesto sauce. I love preparing healthy, genuine menus, especially now that I have a little daughter, Maria. For this reason I pay a lot of attention to healthy eating, starting from the smallest things: snacks. Maria adores her afternoon snacks, they are so yummy! Unfortunately, industrial snacks and other pre-packaged bakery products are tasty, but not as healthy. Home-made cakes and buns are much better for health. Besides knowing what goes into them, we can be sure of avoiding hydrogenated vegetable fats, colour additives, preservatives and other chemical additives. Freddy helps me with that! Just a few hours are enough to prepare a good stock of tasty healthy snacks. What's the recipe I often prepare using Freddy and that Maria really loves? Prepare the syrup: heat water in a saucepan, add sugar. Allow the sugar to dissolve completely, turn off the heat and blast chill at + 3°C with Freddy. While the syrup is cooling, clean and wash the raspberries and blueberries thoroughly under running water. With a blender blend until you get a creamy texture. Add the cold syrup and the strained juice of half a lemon to the blueberry and raspberry puree. Blend well, strain through a fine-meshed sieve and remove any froth with a spoon. Take some wooden ice cream sticks and kitchen foil. Twist the kitchen foil into a small rope, wrap it around one end of the stick and tie to the sides of the lolly moulds. This will keep the sticks upright when you pour the mixture into the moulds. Pour mixture into the moulds leaving 1 cm at the top. Place into Freddy and blast chill to -18°C. Your ice lollies will be ready for serving in a just a few minutes!